Our experts advise on strategy development, Capacity Development and implementation of Integrated Solid Waste Management (ISWM) Systems in cooperation with local organisations and government institutions. Sustainability is at the core of our ISWM. It is very sensitive to the scale of service provisions, the adoption of the local laws and inter-municipal cooperation which are essential to successful implementation of ISWM systems. Skat has been working in the solid waste management sector for last 25 years and also runs the secretariat of Collaborative Working Group or CWG. Dr Sanjay Gupta and Jürg Christen (skat), are members of the Core Group of CWG network. 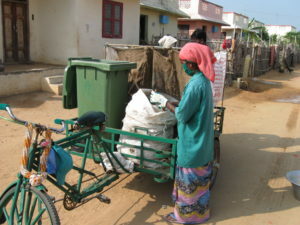 The Collaborative Working Group – Solid Waste Management in Low- and Middle Income Countries is a forum to encourage interaction between partners on key solid waste management issues and to provide the opportunity for improving the standards and sustainability of solid waste management through organizing international workshops and campaigns. Since 1996 Skat and CWG have several useful publications for the World Bank, GIZ, DHIS, DANIDA, SDC etc. based on real implementation experiences of middle and low income countries. Its popular publications include Guidance Pack for Solid Waste Management, Decision Makers Guide to Solid Waste Landfills, Private Sector Involvement in Solid Waste Management, Solid Waste Management and Millennium Development Goals, Super Truck Trump, Faecal Sludge Management, How are we managing our healthcare wastes?, Waste to Energy – Rapid Assessment Tool for Decision Makers etc. Currently Skat is engaged in Solid Waste Management Projects in Ukraine, Indonesia and Kyrgyzstan.